Why migrating to Shopify Plus instead of Magento in Dubai, UAE? As we know, Magento series 1 will be officially phasing out by Fall 2018, however by April 2018, upgrades to Magento 2.0 are possible. We are noticing a significant switch from Magento to Shopify Plus. Why is that so? We, as being the leading Shopify Experts in the UAE & GCC, know exactly what situation companies are in these days. Magento clients are forced to stop at the end of the road fork and wondering, if they should decide to undergo a costly replatforming to Magento 2.0 or if they should look out for other options in the Enterprise level. Magento clients are completely forced to make a move, as it is official, that Magento 1 will completely come to a stop, resulting in the Magento client losing all his users, customers and app store support. Surely there will also be no access to upgrades or further security patches. But knowing this, what should Magento users look out for? Well, firstly, Shopify Plus is the fastest growing enterprise platform and currently the second largest enterprise E-Commerce platform by number of clients. So the migration from Magento will surely be quick, painless and very cost efficient. The hosting is dedicated and site security is at its best for Shopify Plus. If your website e.g. E-Commerce is built on Magento currently, then you are already aware that hosting is not included in your annual Magento fees. You are simply on your own, and finding enterprise hosting solutions can be very costly. Overall Magento is known for being a complex and heavy platform when it comes to hosting, a lot of coding and resources are required and it constantly needs optimizations. Magento 2.0 makes attempts to have the platform more user-friendly, but comparing Magento 2.0 and Shopify plus, it is clear who is the winner! Shopify Plus wins, by hosting, site security, seamless UX & UI, while Magento being confusing and complicated for first-time users. Site Security is a big point, while Shopify plus includes PCI compliance, you will have to take care of that yourself with Magento. Meaning, you also need to determine, which level of PCI compliance does your store require… Enough said? This is all adding up to a lot of work, a lot of resources in terms of manpower and time. Shopify Plus is the winner because they set all up for and you don’t have to worry! Hosting is included in your fee, and all sites are by default level 1 PCI compliant. Further, Shopify does annual on-site compliance tests and run continuous risk management, so you do not have to shoulder that sensitive and costly burden. Shopify Plus is hence much easier, more cost-efficient than Magento. 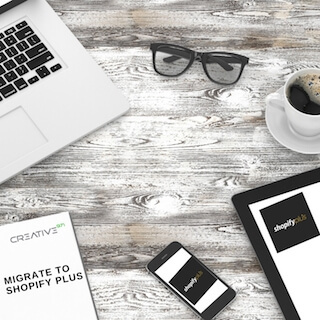 Why else is it great to migrate to Shopify Plus? Firstly, you eliminate your dependence on your costly development team and Shopify Plus also allows you to consistently maintain a quality customer experience. All integrations into Shopify Plus are seamlessly coded and can be seamlessly coded if there is no integration yet, however, the system stays solid. For Magento, one alteration or integration may put your backend order in the shaking. This, of course, does upset you but further, it does frustrate your customers and make them feel unsafe. From the very beginning, Shopify Plus has prioritized quality and maintained a high standard on what apps they approve to be available to their merchants. If in case there is no app that you need in the Shopify Plus or Magento App Stores, means you have to find your own custom build solution. Shopify Plus has released scripts that free up the developers to write their own customizations without compromising on flexibility or maintainability. Building out custom solutions in Magento is less efficient because you have no standard of code. You can surely hire a developer for you to build a customization, but since you are running it on your own server, there will be no one advising you which code works best to achieve a solid result. We hope that the above is able to help you understand the platform differences and we further hope that we have made a case of why Shopify Plus pricing is well worth it compared to Magento. Let us just convince you by a few Shopify Plus examples here in the UAE, e.g. RAW, Atnafas, Georg Jensen. You can surely feel free to approach us for any further clarification points or details if you still feel not certain about migrating your Store on Shopify Plus.